This may not have been your conversational topic over dinner last night. I don’t begin discussions around vaginal pH, either. But, if you’re aiming for natural conception, it’ll become your top daily thought. The sperm and egg cannot meet until the conditions are right. Are you on good terms with your microbiome? This is the flora and fauna that makes up your gut health. Probiotics are great for creating more life-sustaining organisms in your body. Also, a well-balanced pH helps to preserve it. It has a bearing on your fertility status, as well. Your vaginal pH stays in a acidic state for most of the month. This is part of your healthy immune function. 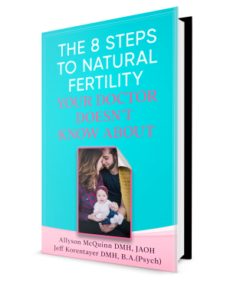 It ranges from 3.8 – 4.5 during the non-fertile part of the cycle. This healthy range helps to prevent infections of bacterial vaginosis and yeast overgrowth. This is why it’s important to take a probiotic after having been on antibiotics. Luteinizing hormone (LH) increases during ovulation, which shifts the cervical mucous to alkaline. This lifts the normal barrier of mild vaginal acidosis. It creates a 48 hour window when the sperm has a fighting chance to make it through to the egg. That is, as long as the couple’s pH balance is in a healthy range. If not, the fertility window remains closed. There are many factors affecting pH, including diet, hydration, and other lifestyle issues. Many couples consume an acidifying ‘spermicidal diet’ due to misguided advice. The emphasis on low-fat, high-carb eating is one of the reasons that infertility is on the rise. If your pH balance is off, then your chances of conception approach zero. The vaginal environment will not allow sperm to pass. Nor will the sperm be models of vital health, either. This is why pH balance is the very first thing we ask couples to correct on their journey to fertility.